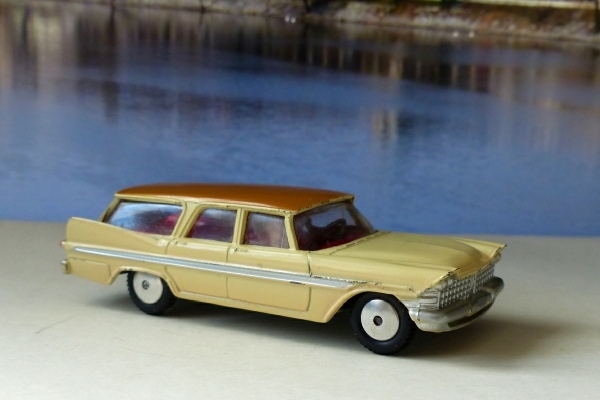 This is the first of three big American Estate cars, or Station Wagons as they would call them. None are that common now which is a bit surprising as they seem the sort of model that most of us would have loved to own in the 1960s. It is a bit boring, I suppose, as it does nothing and this doesn’t even have suspension but it does have a delightfully clean interior, clear windows and nice wheels and tyres. This is in superb condition and looks as good as new This one has the flat fixed hubs. A marvellous example of the earlyish Corgi Toy days. See also the scarce later version with suspension.